One of the foods in Japan you definitely need to try is Soba. Asakusa, as one of the main places in Tokyo as ambassador of the traditional Japan, is home to many Soba restaurants. Next to Iriyama Senbei I wrote about earlier, is Hand-made soba restaurant Towada (手打ちそば 十和田), famous for its Edo Soba. Apparently they us water from lake Towada for their home made soba noodles. Lake Towada is a large crater lake in northern Honshū island. This restaurant also seems to be receiving quite a number of Japanese celebrities. At the entrance there is some kind of altar with photos of famous visitors. From a foreign point of view, it is not that spectacular. I guess a more important selling point for the store is the reasonable price range. For lunch or dinner, prepare to pay JP 1000-2000, a full course will be JPY 3000-4000. The shop has a bit of a run down feeling, giving it a very characteristic working class atmosphere. Proof to this is the unpleasant fluorescent lighting, open Asahi beer refrigerator inside of the store and the cheap looking chairs. I would say it all fits within the price category this restaurant is aiming for. 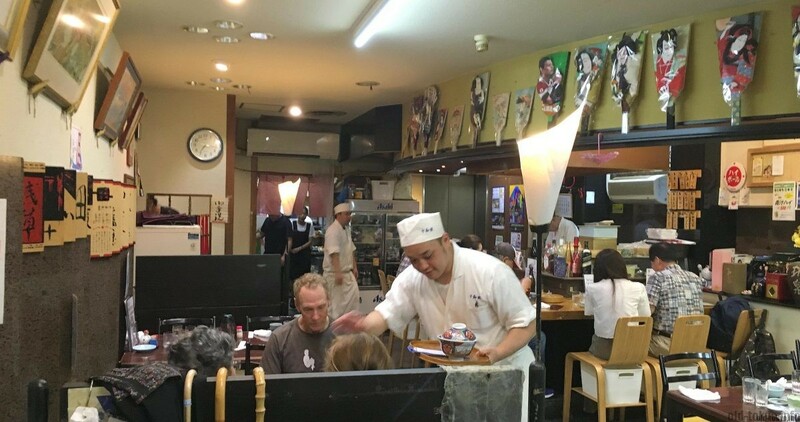 Several (Japanese) reviews on tripadvisr pointed out that this atmosphere perfectly trasmits the shitamachi feeling. 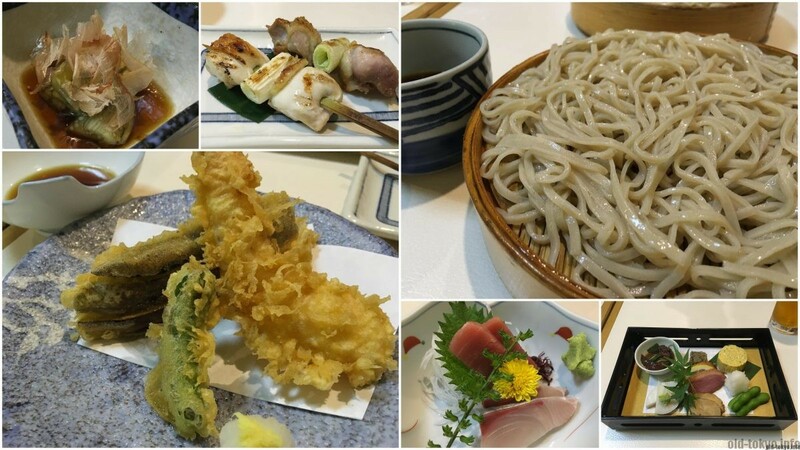 Apart from soba, this restaurant will also serve udon, tempura and the general Izakaya style food items. A full course menu will get you a variety of appetizers, tempura, sashimi and more. I came to this store with a lot of expectations, to really have exquisite soba. But maybe this was the wrong way to approach the food here. What you get is soba in a way that the people from Tokyo like(d) to eat it. I must confess I was a bit disappointed as the soba was ok, but not special at all to my taste. The rest of the dishes were also of a generic quality. I have eaten worse, but I have eaten much better. Not familiar with eating soba? It is very easy. The hot type you just eat as any other type of noodles. you can add some condiments to tast such as cut spring onion. For the cold type you will need to dip the soba in soba liquid, called sobatsuyu. But first put the spring onion and wasabi (to your liking) into this dark sobatsuyu and mix using your chopsticks. Then, bit by bit, add some soba noodles to this sobatsuyu and eat. Very close to exit A1 of Tsukuba Express Asakusa station.